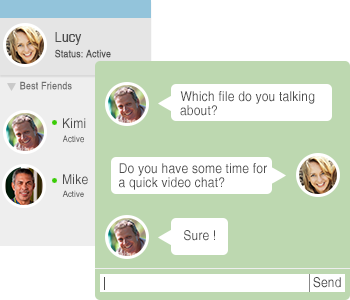 Remotely monitor Instant Messenger chats and automatically record conversions and outgoing files sent via QQ, ICQ, MSN Messenger, YAHOO, TM, UC, POPO, SKYPE, RTX, LSC, ALI, FETION, and Google Talk. IM applications are typically used for personal reasons, but also increasingly used to facilitate business communications. Employees may be allowed to use IM tools in the office environment. So, it's of great importance to control and monitor IM tools to protect information security and improve work efficiency. How can the use of IM applications be effectively monitored? How could you know what files are sent through IM tools? Are there any ways to restrict users to send out files? Or, in case files are sent out, are there any ways to trace them back? With SurveilStar, you will know what your employees are doing using IM applications, how long do they spend on personal chatting during office hours and how often do they chat. You can also control outgoing files which are transferred through IM applications so as to prevent information leakage via this channel. Moreover, the IM conversation contents can be logged and saved for your review in the future days. Administrator can take control over the transferred files via IMs by specifying policy. Step 1: set a policy by choosing "Allow" mode and checking the "Backup" property. Step 2: set another policy by selecting "Block" mode and specifying the keywords of "File Name" property. Apply the above policies, then the transferred files that contain the keywords will be prohibited, while other documents can be delivered, meanwhile, SurveilStar will backup all outgoing files for the administrator to review.